I apologize for being so absent in the last months. Between preparing, presenting and writing my thesis, there has been much time to do anything else. Nonetheless, FAVELissues will soon open up to new writers, bringing new information and updates on different contexts, projects and programs around urban informality. 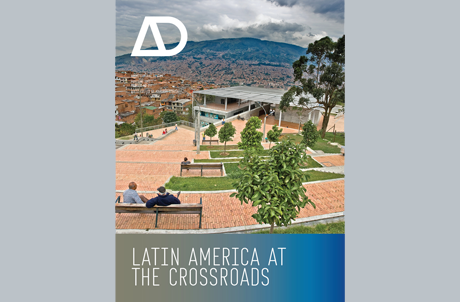 For now, I wanted to mention the up and coming AD issue, “Latin America at the Crossroads.” (CLICK FOR THE LINK) – as there are some very interesting articles in the publication. In it, you will also find an article I wrote based on an interview with Alfredo Brillembourg from U-TT. Exciting, thanks for the heads up. MMBB is an especially great firm. I recently read your response to the UC Berkley prof who proposed that urban planning was the solution to the housing crisis. I agree with much of your response, but I still see that a new type of entrepreneurship can create more sustainable impacts. I’d like to talk to you about this a little bit more since I am currently developing a program for affordable ecological housing for developing areas in Brazil. Talk soon.